CM Magazine: Conquering Everest. (Crabtree Chrome). ISBN 978-0-7787-1175-9 (pbk. ), ISBN 978-0-7787-1167-4 (RLB. ), ISBN 978-1-4271-8928-8 (pdf), ISBN 978-1-4271-8920-2 (html). Mountaineering expeditions-Everest, Mount (China and Nepal)-History-Juvenile literature. Mountaineering expeditions-Everest, Mount(China and Nepal)-Juvenile literature. Edmund Hillary and Tenzing Norgay stepped carefully along the frozen ridge. One wrong move and they would drop off the side of the mountain. Between them and the top of the mountain was a sheer wall of rock. Hillary wriggled up between the rock and ice. Once above the rock step, they climbed a snowy dome and stood on top of Mount Everest. It was 11:30 a.m. on May 29, 1953. These two men had just made history. While Hillary took photographs, Norgay buried offerings of chocolate and biscuits to the mountain gods. 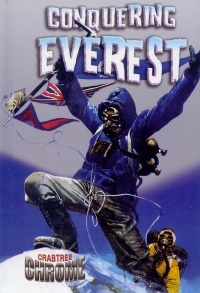 The "Crabtree Chrome" series has an obvious winner in this book about climbing Mount Everest. Designed to grab the imagination of its readers, the book begins with the epic summit of Mount Everest by Edmund Hillary and his Sherpa, Tenzing Norgay. Why would you want to climb it? "Because it's there," a quote by George Mallory, on being asked why he wanted to climb the mountain. Imagine the rush you would feel at the top of the world! Mountaineers from around the globe have tried this climb over the years, and while more than 5000 people have made it, many have not, and their bodies remain frozen up there beside the path for future climbers to ponder. Written chronologically, the book explains how the Himalayas were formed and are still changing. In 1852, the first surveyors, led by Colonel George Everest, mapped the Himalayas, but it wasn't until 1921 that the first attempt to climb Everest was made. The Sherpa people's role in guiding the climbers is interesting. These people are incredibly strong and able to "carry 50-80 pound (23-36 kilogram) packs up the mountains without difficulty." They consider the mountain to be sacred, and, before each climb, they pray and give offerings to their gods. The dangers of climbing are well-explained. The North and South Faces offer different dangers, but on treks up either side, altitude sickness, freezing temperatures and snow blindness are common. Other dangers are the possibility of being blown off the mountain's face, cracks in the ice that can appear in minutes, and avalanches that could bury an entire expedition crew. The first female to reach the summit was Junko Tabei, from Japan, who was buried in an avalanche, dug out by a Sherpa and then continued to the top! Climbing today is relatively easier with the improved warm clothing and light-weight equipment. However, with warming trends, there is less snow and more rock exposed, posing the real danger of more frequent rock slides. The format of the books in this series follows the successfully proven short paragraphs, bolded words, glossary and excellent photographs in both color and black and white. Interesting extra facts or quotes are found in a floating box on every double-page spread. The "Learning More" section at the back offers more books to read and great websites to learn more about Mount Everest. Combining facts and history, Conquering Everest is sure to become a favorite read.